Science fiction's defenders refer to the genre, in its highest moments, as "a literature of ideas." The irony is that on film, the ideas in science fiction are often shoved to the back seat in favor of letting the images take the wheel—whether you think that the Transformers series is trash or treasure, the films' only big idea is "Robot trucks are cool." But in The Hunger Games, the film adaptation of Suzanne Collins' best-selling novel (itself the first in a trilogy), the ideas and the characters drive the story. Avid fans of the books were going to make the film a hit, regardless. It's our good fortune that, much like the people behind the Potter films figured out, you can rake in dough from the crowds and make a beloved book into an actual film of quality. With over 1,000 showings already sold out at this writing, a week before release, look for The Hunger Games to be Lionsgate's biggest-ever hit. Better yet, it deserves to be. Set in a near-future North America called Panem where 12 Districts work in squalor to provide the resources consumed by the glittering Capitol, The Hunger Games takes its title from an annual competition where each district provides a boy and girl, picked by lottery, who are then taken to the Capitol to be trained, media-massaged to provide pre-show entertainment and then forced to fight to the death. First place wins a life of privilege and riches. There is no second place. Jennifer Lawrence plays Katniss Everdeen, the saga's hero, who reluctantly volunteers for the games to take the place of her little sister Prim (Willow Shields). Lawrence is treading similar ground to her Sundance breakout, Oscar-nominated work in Winter's Bone, where she played yet another poor girl fighting to save her family against long and dangerous odds. But Lawrence wholly embraces the film's emotional currents and makes the more outlandish material—a fusion of sci-fi and soap opera that shouldn't work—resonate in a real and centered way. 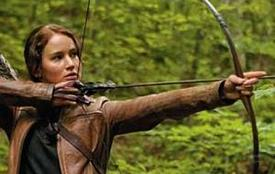 Her Katniss isn't a cardboard saint, but rather, a fully-drawn character. Much as the first Twilight film was improved by Kristen Stewart's performance, where she clearly had not been told she was in a vampire movie based on a horrible book, no one clued Lawrence in that she could coast. Director Gary Ross (who co-wrote the screenplay alongside Collins herself and Billy Ray of Shattered Glass and Breach) makes a series of excellent choices here, some small and some large. While the film seems awfully aware it's the first in a trilogy and uses that as an excuse to skim over much of the book, the screenplay also improves on the structure and voice of the novel. Sure, the speechless servants of the Capitol are under-explained, but the film also abandons some of Collins' more insane inventions and spares us the drone of Katniss' interior monologue. The cast are good-to-excellent—Stanley Tucci's grinning and grim emcee is a standout—while Josh Hutcherson and Liam Hemsworth spin their stock love interest parts into nicely-tuned turns. Ross has also hired a top-notch creative team to make the film depict horrific violence in a real, but restrained fashion-this is, after all, a film for kids that kills kids. To depict the deaths of seven teens as brutal-but-bloodless (and help the film keep a PG-13 rating) editors Stephen Mirrione (Traffic, The Ides of March) and Juliette Wellfling (The Diving Bell and the Butterfly, A Prophet) shape the opening minutes of the Games into something out of The Battle of Algiers, conveying the shock of Katniss' terrified, adrenaline-filled plunge into the thick of kill-or-be-killed action. Cinematographer Tom Stern—best known for his collaborations with Eastwood—lenses the film nicely, while production designer Phillip Messina carefully-yet-casually creates a lived-in future that's a few decades ahead of our own. The allegorical elements of the story are superbly executed: reality TV as a mode of state control with have-nots pitted against each other for the amusement of haves. Indeed, while the left will appreciate the films' depiction of winner-take-all capitalism run amok, the right may enjoy the film's vision of calloused, impoverished sons and daughters of toil being exploited by a bewigged, effete and grotesque elite. And after decades of science fiction epics that are either tired father-quests shoved down our throats with a lightsaber in the wake of Star Wars, or weary New Testament-inspired stories of "the Chosen One," it's amazingly refreshing to see a film where the hero's journey is one of ethics and choice—what does it take to be good in a evil world?—a struggle real people can sympathize with, not just gawk at. As action, as allegory, as cinema, The Hunger Games is the best American science-fiction film since The Matrix, and if Ross and his crew stay with the series for the next two books, we may get that rarest of things: a blockbuster franchise that earns our money through craft, emotion and execution, not merely marketing and effects.